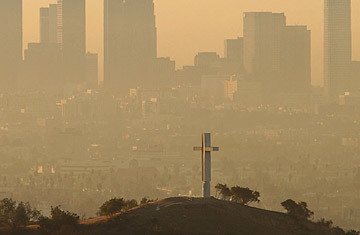 Los Angeles cloaked in smog. The most famous conversion in Christian history is that of Paul, who the Bible says "persecuted The [Christian] Way to death," before the "scales fell from his eyes" on the road to Damascus, and he became a Christian himself. Jonathan Merritt, a seminary student with the Southern Baptist Convention (SBC), is familiar with that paradigm. "I was an enemy of the environment," he says. "I approached it with disdain. And then I was sitting in a classroom and I felt like God spoke to me and put this idea in my heart." The idea  encapsulated in the "Southern Baptist Declaration on the Environment and Climate Change"  is a strikingly potent challenge to his denomination's official stance on global warming and to his own previous scorn. Yes, he says with a chuckle, "you could say the scales fell from my eyes." Merritt's conversion may not change the world quite as much as Paul's, but he has transformed his classroom epiphany into Topic A within his own Convention, the biggest Protestant body in the U.S. with 16 million members  and probably one of the least involved of the American religious bodies in the battle against global warming. Merritt's declaration states, among other things, "We believe our current denominational engagement with these issues has often been too timid, failing to produce a unified moral voice. Our cautious response to these issues in the face of mounting evidence may be seen by the world as uncaring, reckless and ill-informed. We can do better and that threat is too grave to wait for perfect knowledge before addressing it." The declaration commends government action but makes no specific policy recommendations, such as a cap on greenhouse gas emissions. But, most importantly, given its target readership, it argues that stewardship of the planet is just as Biblical as the other causes that Baptists press in public, and that "when we destroy God's creation, it's similar to ripping pages from the Bible." That statement, in its context, is revolutionary. First, because it so clearly contradicts the SBC's 2007 position on global warming, which is a fairly blunt statement that climate change hasn't been proven. And secondly, because it has teeth: its 44 signatories include the current SBC president and two of his predecessors (one of whom happens to be Merritt's father, James) and the heads of three well-known Baptist-affiliated colleges and divinity schools. At a telephone news conference Monday, Republican Senator John Warner expressed solidarity and solicited support for his bill to reduce greenhouse gases. Thus, Merritt, 25, appears to have made an end-run around some of his Convention's usual power brokers, including its Ethics and Religious Liberty Commission, which traditionally has a near-lock on issues of national policy. Asked if it was common for a rump group like Merritt's to collect this kind of firepower, Ethics Commission Vice President Barrett Duke hesitates: "I don't know. It's unusual. I'm sure it's existed, but I can't recall." Duke, whose office Merritt consulted as he was drafting the declaration, has refused to sign. ("The offer's still on the table," says Merritt cheerfully.) While Merritt's declaration supports government action on global warming, Duke says the delegates at last summer's yearly SBC meeting specifically struck language requesting that the government further investigate global warming and try to do more about it. Thus, Duke insists, Merritt's declaration was "at cross-purposes with the express will of a Southern Baptistspassed resolution and we couldn't support it." Nonetheless, the position of Evangelicals in general (of whom Southern Baptists represent a sizable piece) has been swinging ever greener. Back in 2006, megapastor Rick Warren signed onto a statement calling for a reduction in CO2 emissions. More recently, old-line Evangelical leaders, such as James Dobson and Gary Bauer, tried to oust Richard Cizik, the head lobbyist of the National Association of Evangelicals, who has fueled attempts to rally conservative Christians to the environmental cause; but Cizik's organization, while never fully supporting his mission, refused to drop him. Cizik is pleased with Merritt's declaration. "That resolution last summer was really cold water on any Southern Baptist who dared to speak out on the issues," he says. "I'm enough of a realist to know that this issue moves forward in increments. And this is not even a small increment. This is a huge step forward." And it may yet be a step in a new direction of leadership in the SBC, the leaders of whose ultra-conservative "revolution" in the 1970s are now getting long in the tooth. Says James Merritt, Jonathan's father, "That certainly wasn't the motivation behind my son's doing it. But any institution that's going to survive, there has to be a passing of the baton to a new and younger generation, or else it will die."